This year the city of Boston designated an area just one block from my office as an official food truck spot. I'm not sure how the exact process works but each year the local food trucks place their names into a lottery to get spots at one of these official food truck areas. Lunch, dinner, and even breakfast spots are chosen in the lottery and for the season (I'm guessing it's all the time except in the very dead of winter) the truck is assigned for that meal in the designated spot. By the time I was able to go out and grab lunch today it was already 3:30 which is the dinner hour at the truck spot on Milk and Kilby. And luckily for me, one of the trucks found there on a late Friday afternoon was Staff Meal. If I'm not mistaken, the name comes from the meal that is served to the staff at restaurants before the dinner service begins. I was so hungry I forgot to take a picture of the tacos. And really, if I think about it, eating the food rather than documenting it in photos is more important. 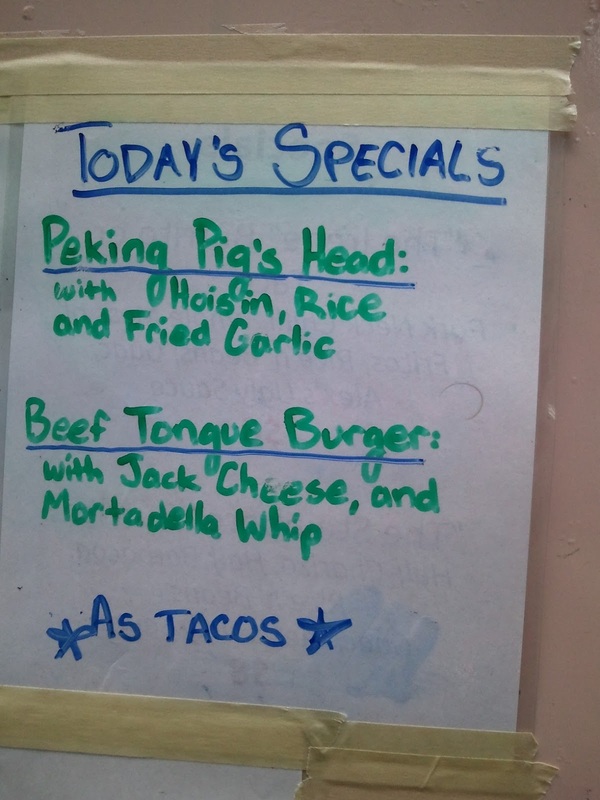 It's hard to decide which of the two was better but if I was forced to pick it'd be the Peking Pig's Head by a small, small margin. They were soooo good. I wish I had more than one of each. I followed up the tacos with a fois gras baklava for dessert. I'm not quite sure what I thought about the baklava. 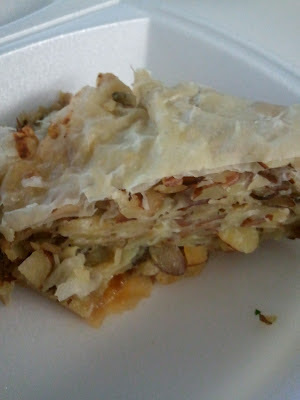 It had layers of flaky phyllo with almonds instead of walnuts or pistachios, and, I assume, the fois gras was mixed in with the filling. It wasn't nearly as sweet as a traditional baklava and there were definite savory elements to it. I managed to take a photo before diving in. I'm still amazed by the types of food we're able to get at food trucks. Kudos to these folks who make unique and tasty food in such cramped quarters. 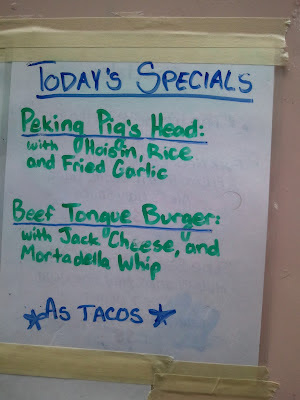 It makes for some very memorable meals and today was no exception.